L = 215 mm; Diameter across necklet c. 150 mm, W band = 13 mm, W band including outer row of beads = 17 mm, diam beads = 2.8 mm, th beads = 2 mm [RTS 21/5/2004]. Collected by Percy Horace Gordon Powell-Cotton and his wife on 9th February 1933 during a shooting expedition [RTS 21/5/2004]. Headband made from a series of small opaque white glass ring beads, threaded tightly together to form a narrow rectangular fillet. These have been arranged in four rows along the body, strung onto a plant fibre cord that runs to and fro across the width of the fillet, with an extra bead threaded onto the side at the point where the cord changes direction. 78 of these extra beads survive along one edge of the fillet; the other edge has a complete set of 80 beads. Double cords were then threaded horizontally in and out of this design to bind the elements together. The two ends of the fillet overlap one another and have been knotted firmly together. A few glass beads of other colours have been incorporated into the design, apparently at random. These include 3 translucent dark blue (Pantone 529C), 1 opaque yellow (Pantone 116C), 1 opaque pink bead (Pantone 196C), and the occasional very light blue opaque bead (Pantone 642C). Most beads have traces of a reddish brown material on their surfaces, possibly some form of ochre; this has also left traces on the cord binding that makes up the fabric of the band; the cord itself is an orange brown colour (Pantone 4635C). The object is mostly complete, but the cord has become frayed along one side and at least two beads are missing. A small, half bead fragment was found with the object and is thought to be part of one of the missing beads. The necklet has a length of 215 mm, when flattened out, and when fully extended the diameter across its outside edges is around 150 mm. The band has a width of 13 mm, excluding the two side rows of beading, and 17 mm if these rows are included. The beads are all of a similar size, with an average example having a diameter of 2.8 mm and a thickness of 2 mm. The headband weighs 25.1 grams. Collected by Percy Horace Gordon Powell-Cotton and his wife Hannah at Peridi on 9th February 1933 during a shooting expedition. While the precise location of Peridi has yet to be established (it lies at co-ordinates 5.23 N., 31.49 E) , it is probably to be located in the modern administrative district of Bahr el Jebel, Southern Sudan, west of Mongalla. The Bari name for this type of object is anrut. Accession Book Entry [p. 248] 1934 [insert] 8 [end insert] - MAJOR P. H. G. POWELL-COTTON , Quex Park, Birchington, E. Kent. Specimens collected by himself & Mrs Cotton, during hunting trips, 1933, viz: [...] [p. 252] - From the BARI tribe, MONGALLA, PERIDI and NGANGALA. [insert] 49 [end insert] - Head-fillet, anrurt , of bead-work. PERIDI (219). Card Catalogue Entry - There is no further information on the catalogue card [RTS 12/2/2004]. Pre-PRM label? - 219, P [trapezoidal piece of brown card, tied to object, RTS 21/5/2004]. Old Pitt Rivers Museum label - Anrut , head-fillet. BARI, PERIDI, E. SUDAN. 5 ° 23' N., 31 ° 49' E. d.d. Major Powell-Cotton, 1934 (219) [rectangular metal edged tag, tied to object, RTS 21/5/2004]. Related Documents File - Typewritten List of "Curios Presented to Dr. Balfour by Major & Mrs. Powell-Cotton. Barri Tribe". 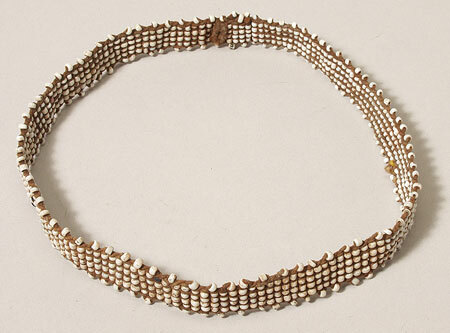 This object appears as item 219: "Head band, 4 rows white beads, native name Anrurt , 9/2/33 Peridi, 5.23 N. 31.49 E". Also contains details of a cine film 'some tribes of the Southern Sudan', taken by Powell-Cotton during this 1933 expedition, copies of which are now in the National Film and Television Archive and the Powell-Cotton Museum in Kent [RTS 14/3/2005]. Sparks, Rachael. "Bari head band" Southern Sudan Project (in development). 03 Jan. 2006. Pitt Rivers Museum. <http://southernsudan.prm.ox.ac.uk/details/1934.8.49/>.